your trusted partner in Garage Door Repair. Whether it's a tool lined man cave, rock band practice space, or an actual spot to park your ride, your Garage needs a working Garage Door in order to unleash its contents to the world. Just going up and down seems deceptively simple, but the multitude of mechanisms tend to wear out over time. Garage Door Guys will make sure that next time you pull into your driveway, your overhead garage door actually ends up over head. If you hear a loud bang in your Garage, chances are someone is not duck hunting in your garage, your GARAGE DOOR SPRING is broken! If your Garage Door Spring is broken your door won't open! ​ Garage Door Guys can provide excellent service within an hour! All of our trucks are fully stocked and ready to serve greater Jacksonville, including all of the Northeast Florida area. ​Five Star Reviews! Same Day Service!We will beat any competitor's price by $20. Trust a Licensed and Insured Company. 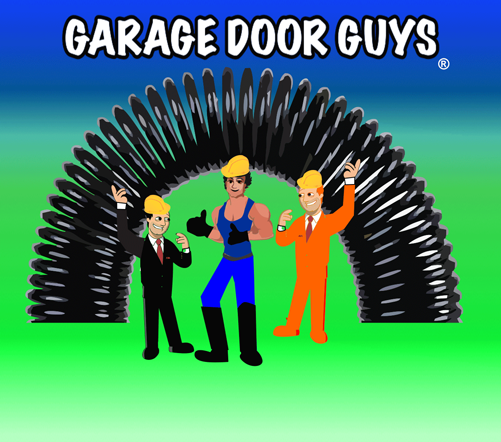 Garage Door Guys highly recommends not operating your garage door with a broken spring as this can lead to more damage and serious personal injury. Save money replacing both garage door springs at once. Garage Door Guys have skilled technicians that can repair any & every garage door problem you can encounter. Including off-track garage doors, broken garage door openers & noisy garage doors. Your garage door is the largest opening to your home & therefore can provide the most curb appeal. Let Garage Door Guys sell you a new garage door and pair it with a professional series garage door opener Today! Garage Door Guys are proud to serve Jacksonville, Jacksonville Beach, Atlantic Beach, Neptune Beach, Mayport, Ponte Vedra, Ponte Vedra Beach, Palm Valley, St. Augustine, St. Augustine Beach, Vilano, Orange Park, Fleming Island and Middleburg, Florida for every garage door need. Our services include Garage Door Repair, Sell new Garage Doors, Broken Garage Door Spring Replacement, Garage Door Tune-Up, Noisy Garage Door Repair, New Garage Door Openers, Safety Eye Alignment, New Garage Door Rolllers, Garage Door Keypads, Garage Door Remotes, Garage Door Smart Phone Technology, Garage Door MyQ Technology Commercial Overhead Door, Service and Repair, Entry Door Repair and much more. You will be glad you did.! Whether it's a tool lined man cave, rock band practice space, or an actual spot to park your ride, your garage needs a working door in order to unleash its contents to the world. Just going up and down seems deceptively simple, but the multitude of mechanisms tend to wear out over time. Garage Door Guys of Jacksonville, Florida will make sure that next time you pull into your driveway, your overhead garage door actually ends up overhead. SAME DAY SERVICE!... to service or repair your garage door or doors. A recent Consumer Reports study revealed that of all homes that have a garage, 74% of all residents use the garage door as the primary access point of their home. In reality, the garage door has become the front door to your home. This is why it is so critical to maintain your garage door and garage door opener. Being proactive rather than reactive will save you money. This is why Garage Door Guys recommends routine tune-ups and inspections of your garage door and garage door opener. Typically if your garage door won't open, you won't be getting into your home. Garage Door Guys have skilled technicians that can repair any and every garage door problem that you can encounter. IF YOU HEAR A LOUD BANG IN YOUR GARAGE, CHANCES ARE SOMEONE IS NOT DUCK HUNTING IN YOUR GARAGE! YOUR GARAGE DOOR SPRING IS BROKEN!.. IF YOUR SPRING IS BROKEN, YOUR DOOR WON'T OPEN!... Operating a garage door with a broken spring can lead to larger problems such as an off-track garage door, broken garage door cables, damage, bent panels and burning up your garage door motor that powers your garage door opener. Garage Door Guys also offers a wide variety of new garage doors and garage door openers. A new garage door is a great way to dress up your home and IMPROVE YOUR CURB APPEAL!... Garage Door Guys only uses the best brands in garage doors and garage door openers. If you need a quote or estimate for a new garage door we will provide one FREE OF CHARGE!... Call Garage Door Guys Today! Contact Garage Door Guys Today!